Cancun VIP Reservations is a travel reservations site specializing in sought-after vacation destinations in Mexico and the Caribbean. As VIP timeshare members of several luxurious, all-inclusive resorts, the Baldonado family offers VIP benefits to their guests as well! 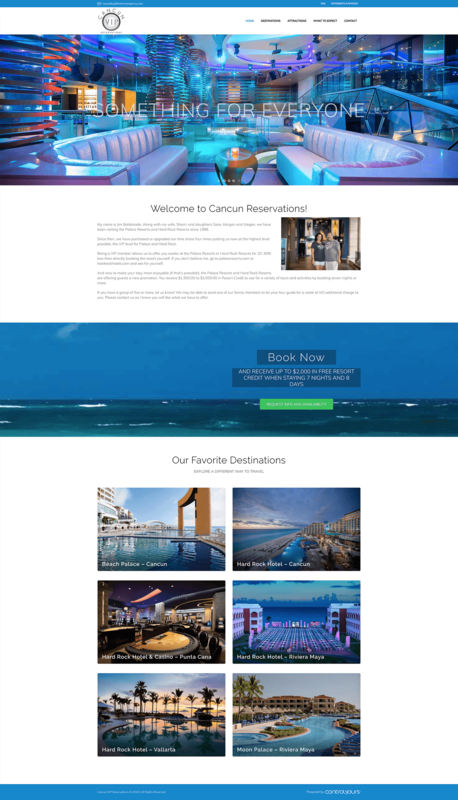 Control Yours redesigned the existing Cancun VIP Reservations website and gave it a fresh, modern update. We incorporated a color scheme based on shades of blue, green and aqua – perfectly representing the exotic, waterfront vacations they offer. We also expanded the website to include several new pages and a larger photo gallery. With their brand new look, we know that Cancun VIP Reservations will continue to delight their guests with the VIP experience!